Equality Illinois advocated for and helped pass three major legislative initiatives in 2015–protecting LGBT youth from harmful conversion therapy, protecting transgender individuals from hate crimes, and gaining the right to specify gender in funeral arrangements. And, we continue to push for a moral budget. Please help us keep pushing forward. Donations made to Equality Illinois during June PRIDE Month will be doubled. 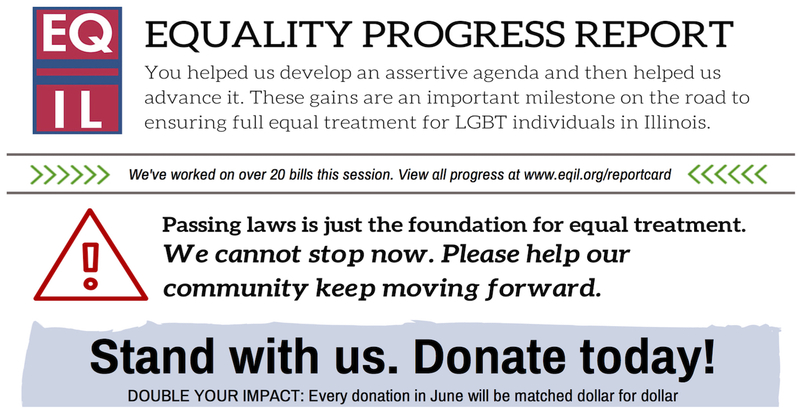 Click the link to read the full Equality Progress Report and to donate today so that we can all ‪#‎LIVEequal‬.